Envy-inducing, movie star locks are the stuff most of us women dream of. Unsurprisingly, there’s a few things you may be doing wrong that isn’t helping your hair get there. Are you guilty of these six bad hairstyling habits? Believe it or not, shampooing your hair too often may actually work against you! No, we aren’t suggesting running around with dirty, oily strands, but do try and take a break between your washes. If you can, try shampooing at least every other day, especially if you are typically washing daily. Overshampooing can strip hair of its natural oils and end up drying it out. Try a great dry shampoo like Bumble & Bumble Hair Powder or Osis Dust It to help keep hair looking fresh. 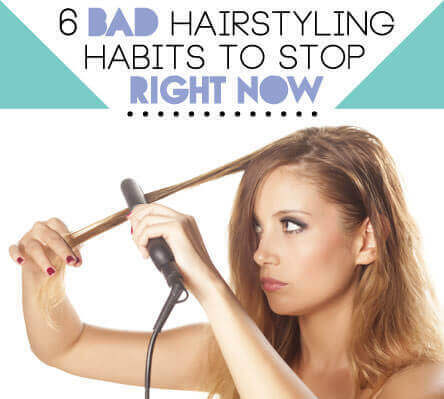 From flat irons and curling wands to our blow dryers, we’re all guilty of being addicted to our hot styling tools. But hot tool abuse leads to split and dry, damaged hair. When using your hot tools, don’t gravitate toward the highest heat possible; instead, try a low or medium heat setting. Fine to medium hair should always be used on these settings, only very thick and course hair really needs high heat. To prevent and minimize damage, use a thermal protecting spray before styling. Think your hair is already damaged? Read about the six ways you may be damaging your hair. Are you using the right brush size when blow drying your hair? If you’re drying your hair straight and not sure what round brush to try, use your hair length as a cue. If you have shorter hair, you should be using a smaller brush with about a one-inch diameter. For longer hair, use a medium to large brush that’s at least a few inches around. Styling products are great for just about anything from adding volume to your tresses to helping reign in control of your mane. But when you’re a styling product junkie that overdoses on products, they end up working against you. Too much mouse, gel or pomade will actually weigh down hair and often, result in a greasy look and unnatural texture. Stick to small amounts. If you’re growing your hair out, it can be tempting to skip out on your regular trim but the fact remains, your hair needs one at least every six to eight weeks! Don’t skip out on this importance maintenance check; it will keep your hair healthy and in tip top shape. Do you dry and style your hair haphazardly, or take it into organized sections like they do at the salon? A good style starts with properly sectioning off your hair. To do so, divide your hair into three sections, split horizontally. Get some clips or pins to secure the topmost sections so you can concentrate on the bottom. Then, just work your way up! If you’re one of the many that are maxed out on time and energy when it comes to your tresses, check out The Lazy Girl’s Guide to Cute Hair.